The USDA Prime grade is the highest consumer grade, and only about 2% of all beef produced in the U.S. qualifies as Prime. The USDA assigns quality grades based on the density of marbling (that’s the intramuscular fat) within the beef muscle, specifically, within the rib. 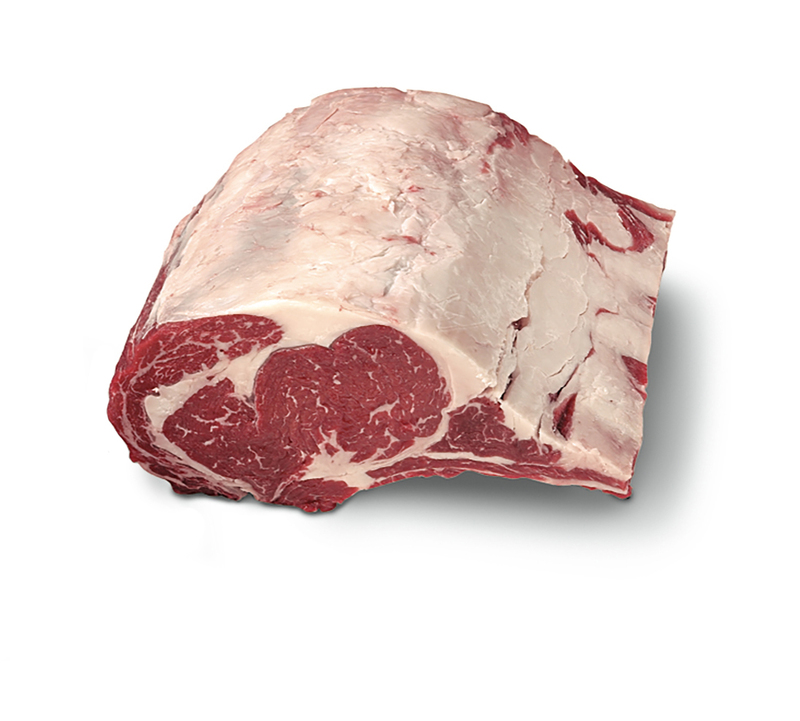 According to USDA standards, Prime grade has “abundant” marbling. Choice and Select grades of beef make up about 70-80% of all beef produced and have marbling density designations of “moderate” and “slight,” respectively. Therefore, when choosing a roast, the most tender, most flavorful, and juiciest will be the one with the most marbling: Prime grade. So the bottom line is this: Not all rib roasts are a true prime rib. 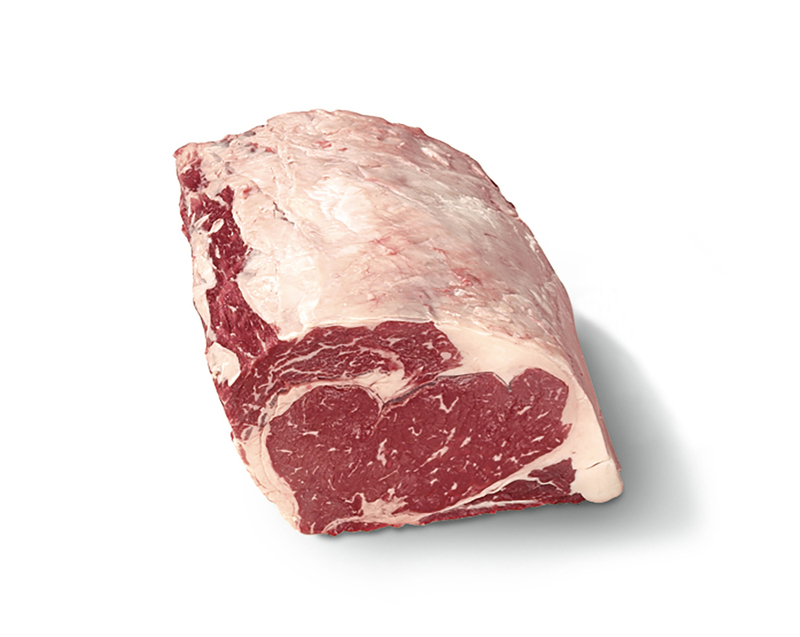 In fact, in common use, a USDA Choice or Select graded roast are still—mistakenly—referred to as prime rib. Only USDA Prime-graded rib roasts qualify as a true prime rib. Fourth-generation butcher Stanley Lobel demonstrates this difference in terminology in this video on our YouTube channel here. The rib bones are still attached to the eye of the roast. Roasting with the bones on adds flavor. 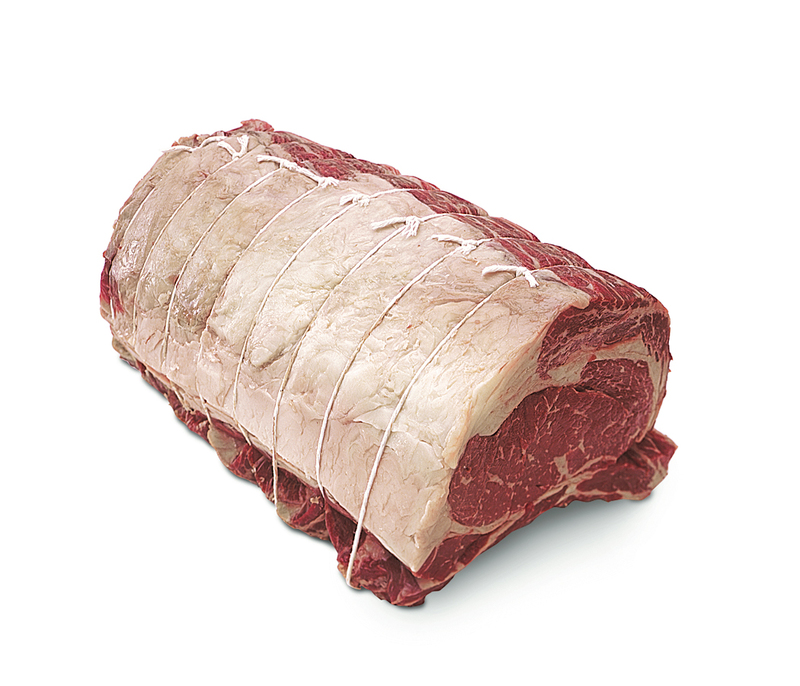 This cut is also referred to as a Standing Rib Roast. The rib bones are removed. Without the bones, slicing and serving are very easy. The name of this roast might be confusing, but if you know that a butcher refers to the process of removing the bones from a cut of meat as “boning” or “boning out” the meat, and the resulting cut is then said to have been “boned” or “boned out,” you’ll understand why this roast is called “boned and tied.” This is the best of both worlds: the rib bones are separated from the eye of the roast and then tied back on with butcher’s twine. This gives the benefit of roasting with the bones for maximum flavor and the convenience of slicing a boneless roast. Once removed from the heat, simply snip the butcher’s twine and lift the eye of the roast off the rack of ribs. When shopping for a roast in your local supermarket, here are a few points to keep in mind to choose the best of what’s available. Look for a roast that has even color throughout. For the flesh, the meat should be cherry red and the fat should be creamy white. Reject any roast that has any off colors, such as blue or green, particularly around the bones. If the roast is in vacuum-sealed packaging film, expect the color of the roast to be brown. Beef deprived of oxygen turns from red to brown. Once exposed to the atmosphere when the packaging is opened, the beef will “bloom,” that is, it will return to its red color within 15 to 20 minutes. For the most flavor, tenderness, and juiciness, look for a roast that has the most marbling, the fine lacey-like striations of intramuscular fat running through the roast. Not all roasts are created equal: Even Choice-grade roasts will vary in the amount of marbling they contain—within a certain range. So don’t be afraid to pick through the available roasts to get the one that looks best to you. Knowing what to look for will ensure that you pick the best available roast. And, when you start out with a great raw rib roast, you can be assured of having a great finished roast for all to share.